Your hotel can be 5 star like the one pictured right, or just a simple, low-budget affair consisting of a log pile with some drilled out holes but whatever you can do to make these beneficial visitors welcome is a help to them and you. And the room rates for your hotel? You'll receive payment in kind in the form of pest control and pollination. If you have room on the ground floor, you might want to include a hedgehog nest. Hedgehogs look for warm places in which to hibernate over winter and you can create one quite easily by using a wooden crate filled with straw to keep it warm and cosy. It is better to provide a tunnel-type entrance to the crate either by nailing four pieces of wood together or by using a wide clay pipe. Try to make the nest as waterproof as possible and even cover it with leafs and straw for added warmth. You need to make sure you provide adequate ventilation. The best way to do this is to drill a hole in the back of the box and run a piece of garden hose out into the fresh air. Check the hose every now and then to make sure it isn't blocked. When it wakes up, your hedgehog will of course emerge feeling rather hungry and get straight to work devouring slugs. Since you've been so accomodating, he'll probably stay in and around your garden for the whole year. Frogs and toads need a frost-free, damp place to hibernate in and you can provide one using old terracotta pots. Put some leaves inside and over the pots to make them feel at home. These guys will also make short work of slugs. Ground beetles and rove beetles come in all shapes and sizes and although they do eat worms and just about any other invertebrates which can't outrun them, they are largely a gardener's friend eating all sorts of insect pests including cutworms, leatherjackets, slugs, snails, aphids and caterpillars. Some can even tackle the New Zealand Flatworm so they're definitely worth having around. A pile of rotting wood is all they need to make them comfortable and they'll sleep here during the day, coming out to hunt at night. They'll also use the woodpile over winter. 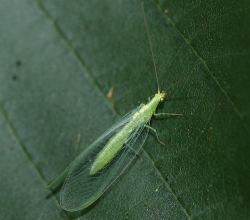 Lacewing larvae are voracious predators of a number of small pests - aphids, spider mites, leafhoppers, mealybugs, whitefly and the eggs of caterpillars. Given the chance, they'll even eat each other! In winter they'll look for a warm place to hole up in. You can stuff a pipe with some straw or corrogated cardboard or you can stack up some perforated building bricks and stuff the holes with straw. Ladybirds overwinter under much the same conditions as lacewings only they might want bigger rooms since they like to cuddle up to other ladybirds in winter. They'd also prefer you to stuff the pipes with bark rather than straw. Both ladybird larvae and the adult ladybirds consume aphids, mealy bugs and scale insects. Solitary bees will move into your hotel in the warmer months. 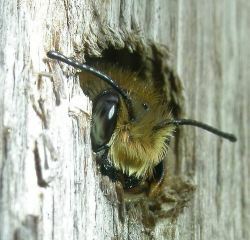 These bees look for holes in wood often created by beetle larvae and use the holes in which to nest or shelter. 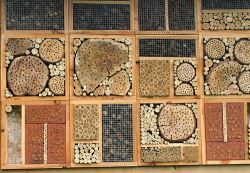 To make your solitary bee rooms, all you need to do is to drill holes of varying sizes into wooden logs or old pieces of wood (don't use treated wood). Drill the holes in a slightly upward direction to stop the rain getting in. Some solitary bees prefer to nest in hollowed-out stems so you could put a bunch of hollow bamboo canes or any stiff, hollow stems into a clay pipe for them. If you put a roof on your hotel to prevent it getting damp in the winter, the solitary bee larvae will be able to overwinter there. Solitary bees can be very loyal to their nest sites so, once you build one, make sure you don't move it. Where you put your hotel depends on what you want to attract. Hedgehogs, frogs, toads and ground beetles will want to be in the shade. Lacewings, ladybirds and solitary bees will appreciate somewhere a bit warmer. If possible, you should have your hotel in a quiet, sheltered part of the garden with the ground floor in the shade, sheltered by plants and the upper storeys in the sun with a clear 'runway' so the flying insects can get in and out of it. If all this seems like too much work for you, there are loads of sites where you can buy ready made wildlife homes. Habitat Aid has hedgehog boxes, frog and toads refuges and insect houses for sale on their website. Half the profits they make go to specialist charities working to protect and promote biodiversity in Britain. Wildlife World also has an interesting range of insect houses in all shapes and sizes.